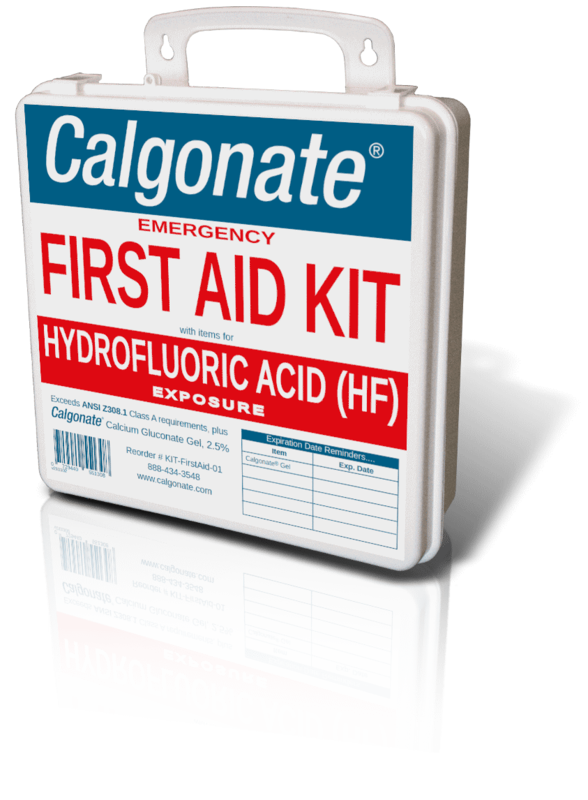 Hydrofluoric acid is produced from the mineral fluorspar, also known as calcium fluoride and concentrated sulfuric acid. When combined at 250°C, these two substances react to produce hydrogen fluoride. It is a colorless, fuming liquid or gas that is comprised of a hydrogen atom and a fluorine atom. The dissolved form is called hydrofluoric acid. Hydrofluoric acid is a highly corrosive solution of the chemical compound hydrogen fluoride in water. It is used mainly for industrial purposes, for example, glass etching, metal cleaning, electronics manufacturing, etc. It is extremely hazardous as it can penetrate human skin, allowing it to destroy soft tissues and decalcify bones. Anhydrous HF is considered to be pure hydrogen fluoride. It is a water-free vapor of hydrofluoric acid; used in conjunction with vapor of either water or alcoholic solvents (e.g. methanol) to etch silicon oxides on the wafer surface. It is used in the production of refrigerants, herbicides, pharmaceuticals, high-octane gasoline, aluminum, plastics, electrical components and fluorescent light bulbs. Aqueous HF is a water solution of hydrogen fluoride. It is mainly used in stainless steel pickling, glass etching, metal coatings, exotic metal extraction and quartz purification. Source: Segal, Eileen, B “First Aid for a Unique Acid, HF: A Sequel” Chemical Health and Safety, Jan/Feb 2000 vol. 7, #1, p19. Both liquid and vapor can cause severe burns, which may not be immediately painful or visible. HF will penetrate the skin and attack underlying tissues. Large or multiple burns totaling over 25 square inches of body surface area may also cause hypocalcemia and other toxic effects which may be fatal. Prolonged contact with very dilute HF solutions will cause burns. Both liquid and vapor can cause irritation or corneal burns. Mild Exposure: Can irritate nose, throat and respiratory system. Onset of symptoms may be delayed for several hours. Severe Exposure: Can cause nose and throat burns, lung inflammation and pulmonary edema. Can also result in other toxic effects including hypocalcemia which, if not treated properly, can be fatal. Can cause severe burns to the mouth, throat and stomach and may result in death if swallowed. Even ingesting small amounts of dilute HF will likely cause profound and possibly fatal hypocalcemia and systemic toxicity unless medical treatment is immediately initiated. Depending on the concentration of HF used at the time of the accident, the symptoms of the burn may be immediate or delayed. HF concentrations greater than 50%: Immediate burns appear. There is a rapid destruction of tissue beginning as a whitish discoloration, usually progressing to blisters, accompanied by severe pain. HF concentrations between 20 and 50%: Symptoms can be delayed one to eight hours. HF concentrations less than 20%: Symptoms may be delayed for up to 24 hours. HF concentrations as low as 2%: If exposure to the acid is long enough, symptoms can appear. Orders ship within 1 business day. 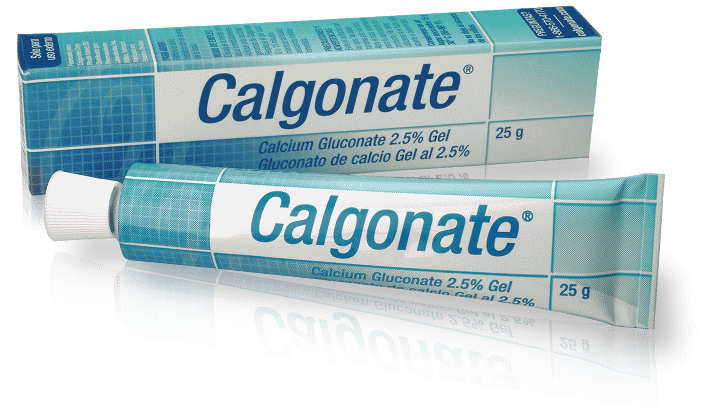 Calgonate® Gel and Calgonate® Eyewash are manufactured in the USA at cGMP FDA-approved facilities. ©2018 Calgonate Corp. All rights reserved.